« Why Training Does Not Create Great Leaders? Today’s MBA’s and managers are trained to extract value. Most executives work on administering, improving efficiency, making sure things are done effectively, managing people to get the best out of them. How many are there to Create long lasting Value? How many are willing to change the rules of the game? How many are willing to ask why are we doing these things? Is there a better way? You can extract value to a limited extent. Unless you create more value you cannot extract more value. MBA’s have to be taught to create value. That in fact Value Creation is the top task of an executive. Not just Value Extraction. So we need Master’s in Value Creation and Master’s in Value Management and transform the company to create Value for Employees, Customers, Partners, Distribution Channel and thereby for the Shareholder. 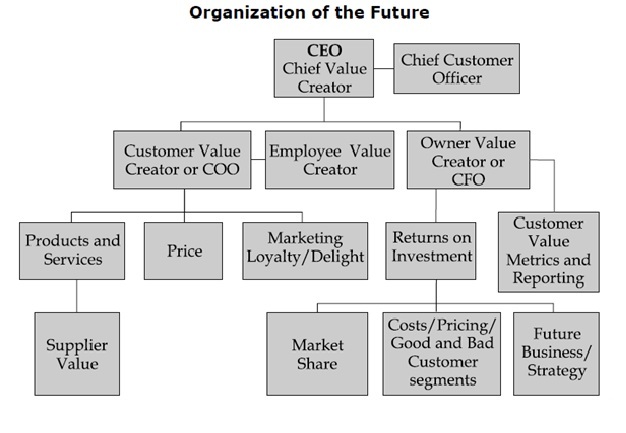 Below is the organisation chart of the company of the future, taken from my book, Total Customer Value Management: Transforming Business Thinking. Everyone has a Value creation role. Contact Customer Value Foundationto transform yourself to Create Value. This entry was posted on May 13, 2013 at 5:56 am and is filed under Business & Management. You can subscribe via RSS 2.0 feed to this post's comments. You can comment below, or link to this permanent URL from your own site. It is nice to know your slide show on MBAs and need for value creation. I am sorry to say that today’s MBAs ( as you said..) are not even value extractors.. I always refer them as value eroders ! I m a professor at NITIE Mumbai.. an MBA institute. My point is like this..
An MBA spend > Rs. 20 lakhs in two years of MBA , and DO NOT earn even a single ruppee.. does it mean a student is extracting any value out of MBA.? It is utter nonsense.. What an MBA earn when s/he completes one’s MBA is not the issue. A real MBA need to earn when value is spend in real time. Dr. Mandi .. Professor of Dhanda..
A great stimulation to change and to move foreward! I would only suggest for your organigram to put the ‘return’ side of the CFO directly under the CEO’s responsibilities: he must be the first watcher of segment shares, etc.